In the last few weeks of 2018, we saw several offers marketing Chase Pay primarily through digital channels. It would seem that, in addition to its recent commitment to issue contactless cards, Chase is still very much committed to making its own mobile wallet a viable payment option. 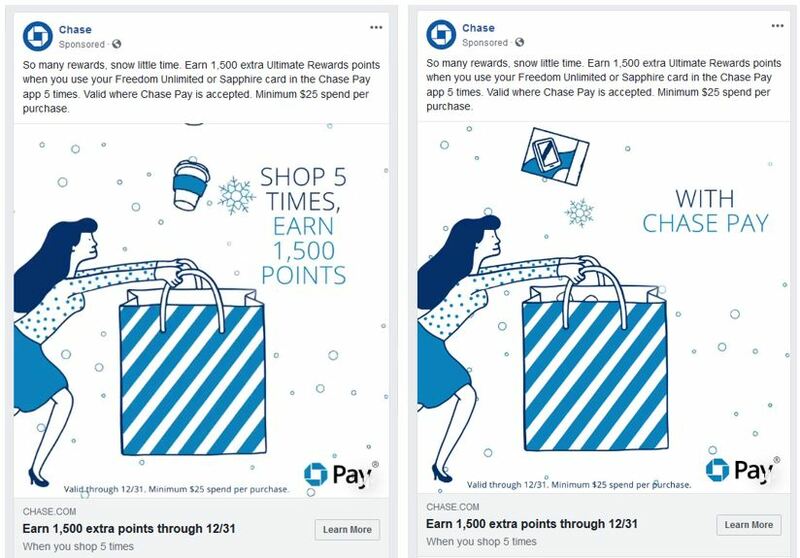 Interestingly, these recent efforts include both bonus point offers and partner savings offers – presumably to ensure that all cardholders have incentives to use Chase Pay. For Freedom, Sapphire Preferred and Sapphire Rewards, Chase is offering 1,500 Ultimate Rewards points when cardholders make five purchases over $25 using Chase Pay. We found this animated holiday shopping post on Facebook the week before Christmas. Chase is also making an effort to promote savings with Chase Pay partners. This makes a lot of sense as it highlights where Chase Pay is accepted. But it’s also a way for Chase to habituate and lock-in spend with those partners. 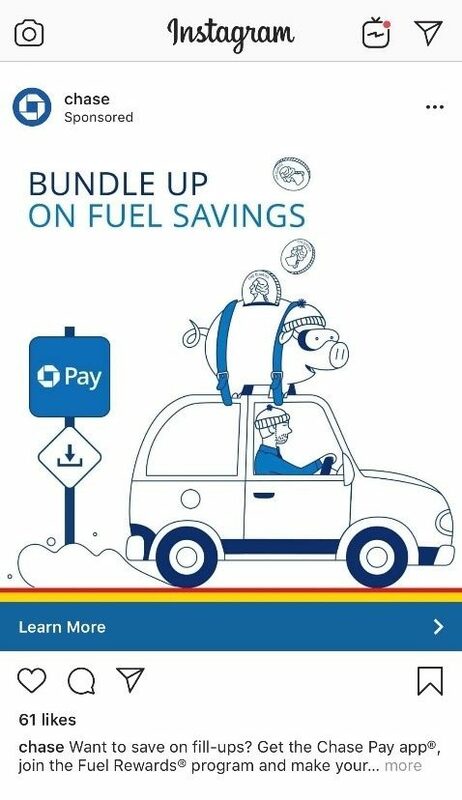 For example, this Instagram post touts a 25¢ per gallon fuel savings offer for cardholders who join Shell’s Fuel Rewards program and link it to their Chase Pay accounts. 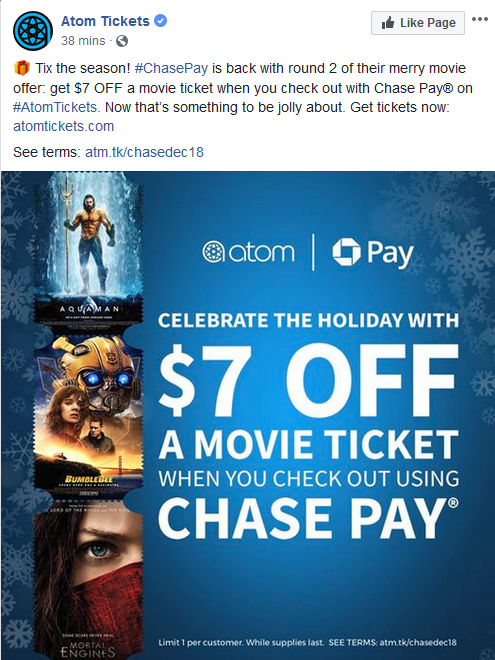 And this Facebook post from Atom Tickets promotes $7 off a movie ticket when cardholders use Chase Pay with the Atom Tickets app. Similar offers are highlighted on the Chase Pay site, including a discount at Quiznos. What is clear from all of these offers is that Chase wants its cardholders to not only get Chase Pay, but actually use it. And Chase is incenting that usage with fairly decent bonuses and discounts that don’t require much effort. It’s a logical strategy for Chase to follow. As the largest credit card issuer in the U.S., it has an obvious interest in giving its 48 million cardholders simple, fast and secure payment options. By continuing to promote Chase Pay, it can build momentum for its own mobile wallet product, which gets both cardholders and merchants using more of what the brand has to offer.